From the moment that the American Film Company released The Conspirator, questions have been raised about the films accuracy regarding the lead counsel, Frederick Aiken. Was he, as FoxNews host Bill O’Reilly would opine, a “pinhead” or a “patriot?” You be the judge. Little has been written about Frederick Aiken. This Week in the Civil War posted some preliminary materials back in April, and they it still seems to be the only biographical material out there. You can read the biography post here. The life of Frederick Aiken is still a mystery. Perhaps someday we’ll know more about his story but until then, we’ll dig up every rudimentary detail that we can find. In the meantime, the Surratt House Museum website has an index of .pdf files on the trial that you can download here. It would be a great place to start your own research into the career of Frederick Aiken. The first one is Assassin’s Accomplice by Dr. Kate Clifford Larsen, from which the film, The Conspirator, was based upon. The other book is American Brutus by Michael W. Kauffman. 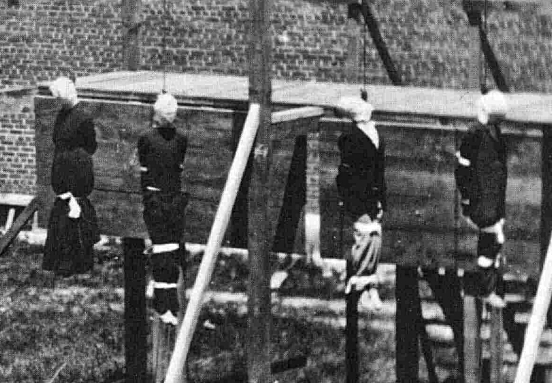 The Assassination Conspirators Hang - from left: Mary E. Surratt, Lewis Powell, George Atzerodt, David Herold. Photo by Alexander Gardner. You be the judge. Was Aiken a “pinhead” for representing Surratt in the first place, and setting himself up for the inevitable fall that would occur if/when she was found guilty? Or was he a “patriot” for undertaking a task that he knew might be ruinous to his future career? The one thing that we know for sure is that Frederick Aiken was a victim of his own inexperience as an attorney. Director Ron Maxwell — who owes Washington County $263,000 on an overdue loan — said Thursday he’s “absolutely” confident he still can make the last movie in a Civil War trilogy. Maxwell made “Gettysburg,” which came out in 1993, and “Gods and Generals,” which was released in 2003 and filmed largely in the Tri-State area. In 2002, Washington County gave Maxwell a $300,000 loan to start working on “The Last Full Measure” by 2005 and produce at least half of it in Washington County. 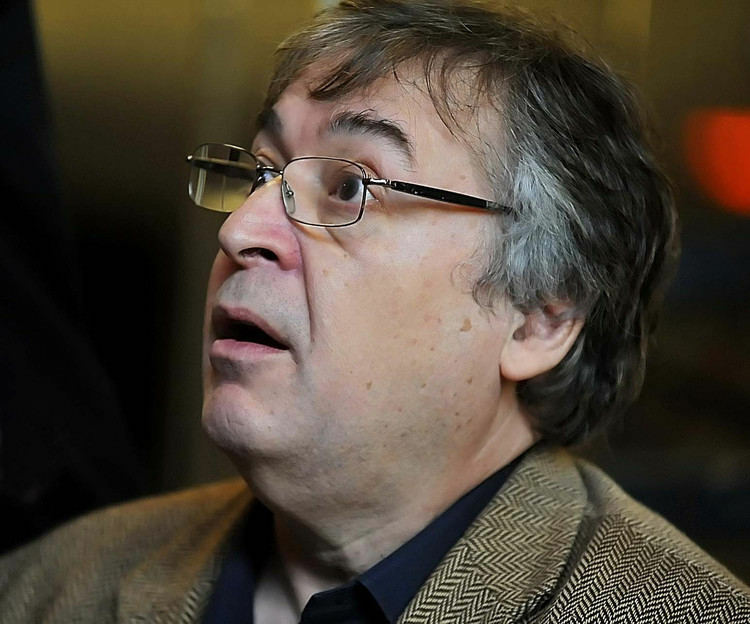 Otherwise, he had to repay the money, plus 4.5 percent annual interest, by 2010. “It’s being paid over a number of years and it continues to be paid, and it will be paid. That’s … all I can tell you,” Maxwell said during a brief interview as he left a Maryland International Film Festival VIP reception in Hagerstown on Thursday. But Maxwell’s last payment was $19,107 on June 2, 2008, according to county officials. That leaves his debt at $181,786 on the principal and $263,041 total, including interest. When The Herald-Mail wrote about Maxwell’s loan debt in 2007, County Attorney John M. Martirano said the county was considering a lawsuit to collect the balance. Assistant County Attorney Andrew F. Wilkinson said in August that a lawsuit was still possible. For now, however, the county continues to talk to Maxwell and his Washington, D.C., attorney, Richard J. Leighton, Wilkinson said Friday. He said he and Leighton are scheduled to confer again in mid-November. Leighton couldn’t be reached for comment Friday afternoon. But none of the four commissioners contacted Friday was satisfied with Maxwell’s progress in paying his debt. Commissioner Ruth Anne Callaham said loans in the film industry are risky. She said the county now needs to focus on getting repaid. When he met with the commissioners, Maxwell suggested alternatives to repaying the loan, according to Commissioner William B. McKinley. One was a local film festival, which would attract people to Washington County and boost hotel-motel tax revenue. McKinley said that wasn’t reasonable. “We need the money back,” he said. “I think we’re getting to the point where negotiations are ending” and the matter will go to court, Commissioner Jeff Cline said. Cline questioned the image of Maxwell’s red-carpet entrance at The Maryland Theatre on Thursday evening. “He arrived in a white limo to a town he owed $300,000 to, and he was treated like a hero,” Cline said, wondering why Maxwell couldn’t have at least made small payments in the last three years. Commissioner John F. Barr couldn’t be reached for comment on Friday. Eight years have passed since he started trying to make “The Last Full Measure,” so “if we get it done within the next two years, we’ll be on schedule …,” he said with a laugh. “One thing you can put in print: I will never turn my back on this county,” Maxwell said. Jeff Shaara wrote “The Last Full Measure,” a book Maxwell has tried to turn into a movie. Hagerstown attorney D. Bruce Poole, who represents Shaara, said Shaara and Maxwell haven’t spoken in years about making a “The Last Full Measure” movie. But Shaara “is confident that under the right circumstances,” the movie could be made and would be successful, Poole said. Maxwell and Shaara each own 50 percent of the movie rights, according to Poole. The loan agreement called for Maxwell to make quarterly payments to the county. However, records show he made one payment in 2006, four in 2007 and one in 2008. The loan for “The Last Full Measure” followed an earlier loan Maxwell’s film company secured in 1997 to make “Gods and Generals.” Washington County and the city of Hagerstown backed $300,000 of the loan, The Herald-Mail reported at the time. Maxwell’s film company repaid that loan. “Gods and Generals” cost about $56 million to make and had a domestic gross of about $13 million, according to the movie-industry website http://www.IMDb.com. A director’s cut DVD of nearly six hours, twice the length of the theater version, was more popular. RICHMOND, Va. – The Capitol of Virginia, onetime seat of the Confederacy, is being converted for a few weeks more in keeping with how it looked at the close of the Civil War — for filming scenes from Steve Spielberg’s major production, Lincoln. 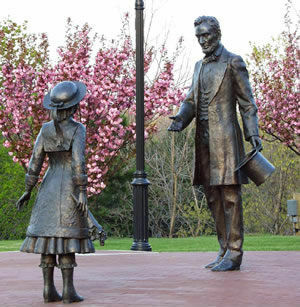 Bronze statue of Grace Bedell and Abraham Lincoln, Westfield NY. Spielberg and members of his production company were guests Monday night of Gov. Bob McDonnell at Virginia’s Executive Mansion, just a few hundred feet from the state Capitol. On the grounds of the 200-year-old seat of Virginia government, the grass is going without mowing in spots for some weeks to give it a more natural appearance at the request of the filmmakers. Lincoln visited Richmond after the fall of the Confederacy in 1865, shortly before his assassination. Rita McClenny, head of the Virginia Film Office, said Spielberg’s moviemakers will be filming on Capitol Square in Richmond and other locations including Petersburg this fall through December. The film stars Daniel Day-Lewis in the title role and Sally Field as Mary Todd Lincoln. It also was a stand-in for official Washington in the films “G.I. Jane,” “First Kid” and The Jackal. Its building interiors also served as the gloomy environs for Hannibal. 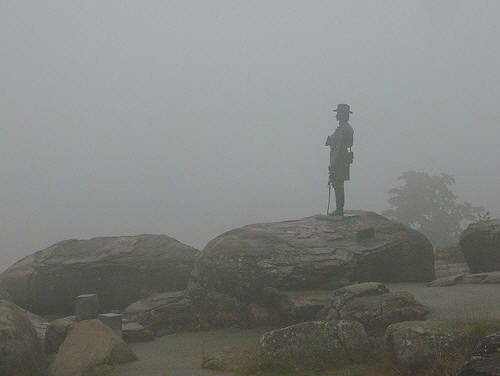 And the region assumed an 18th century look for HBO’s miniseries John Adams. VIENNA, Va, May 31, 2011 — I understand from friends that I deserve a commendation medal for lasting through the full two hours of the much-touted “Gettysburg” on the History Channel last night. Many civil war buffs did not last more than twenty minutes before tuning out. It’s a major indictment of a supposed documentary when the best part is the GEICO caveman commercial of his buddies playing Civil War re-enactors, complete with crocs and socks and modern technological pocket devices. One can start at the top and go through it, itemizing the inaccuracies and second-rate acting and staging of “Gettysburg.” Suffice to say that Tony and Ridley Scott should go back to the entertainment movies they produced (“Gladiator,” “Black Hawk Down,” and “Top Gun,”), as well as the current TV show, “The Good Wife” on CBS, and forget trying to manage a Civil War documentary. We can skip comment on the screw-top canteens, the erroneous insignia on hats and uniforms, the white haversacks and free-swinging cartridge boxes – all of which could have been avoided by consulting any of a number of books available on the subject of uniforms and accouterments. The film obviously was filmed nowhere near Adams County, Pennsylvania, much less at the battlefield. The terrain was totally incorrect, the woods too heavy (remember a lot of the real place was farmland) and the “town” scenes looked nothing like the actual place. One wit opined that it must have been filmed in Albania, with locals playing the soldiers! Then, we get to the totally gratuitous and constant violence, most of which was out of context: the same man’s skull was split in half three different times. And, while Sgt. Amos Hummiston was in the battle and did die there holding the ambrotype of his three children, that’s ALL that is known of his life or wartime activities, in contrast to the bayonet wielding scenes in the program. The characterizations left a lot to be desired, and only Gen. Dan Sickles came through with any degree of accuracy. There was no mention of Col. Joshua Chamberlain, who was one of the main protagonists those three days; Gen. Robert E. Lee was only “pictured” once, looking like a bad impersonation of himself, and riding a WHITE horse!! Traveller, as most people are aware, was a gray or roan. The two main characters were Union Col. Rufus Dawes of the 6th Wisc. Regiment, Iron Brigade, who wore the same expression of bewilderment every time he was shown, and Confederate Gen. William Barksdale, who was part of General Longstreet’s Division, who charged Sickles’ position, resulting in the loss of 50% of his troops. Yet–Longstreet was never even mentioned! Another notable for his absence was General George Pickett, as in Pickett’s Charge, characterized three times as an “epic” moment in the battle, but its leader was never shown. The Confederates brought 160 cannon to the battle, in a line said to be two miles wide across the landscape, the Union having 100 of the mammoth killing machines. Some of the charges coming from Culp’s Hill and Cemetery Hill were impressive, but it was in the tight shots that inaccuracies and anomalies prevailed. To someone viewing the documentary that knew nothing about the battle, they may have ended up with a slight glimmer of its importance. To any true Civil War devotee or reader, it was a waste of two hours. I can hardly wait to see the next segment on “Lee and Grant,” Heaven help us all. It’s just sad that in an attempt to spotlight a major battle of the civil war, a program like this comes across as merely a dim bulb. LOS ANGELES (AP) – Kevin Jarre, who wrote the screenplays for the movies “Glory” and “Tombstone,” has died. He was 56. 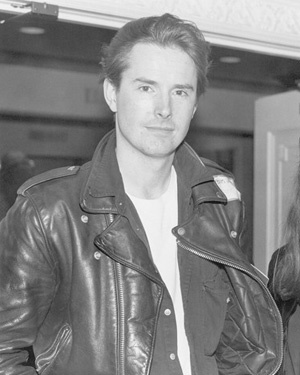 His aunt, Patty Briley Bean, tells the Los Angeles Times that Jarre died unexpectedly of heart failure on April 3 at his Santa Monica home. Jarre was a history buff who was entranced by the Civil War since childhood, when he’d received toy soldiers for Christmas. His research on a black regiment led him to write the 1989 movie “Glory,” which won three Academy Awards, including one for actor Denzel Washington. His 1993 “Tombstone,” about the shootout at the OK Corral, got mixed reviews but was a hit. He was the adopted son of Oscar-winning composer Maurice Jarre. 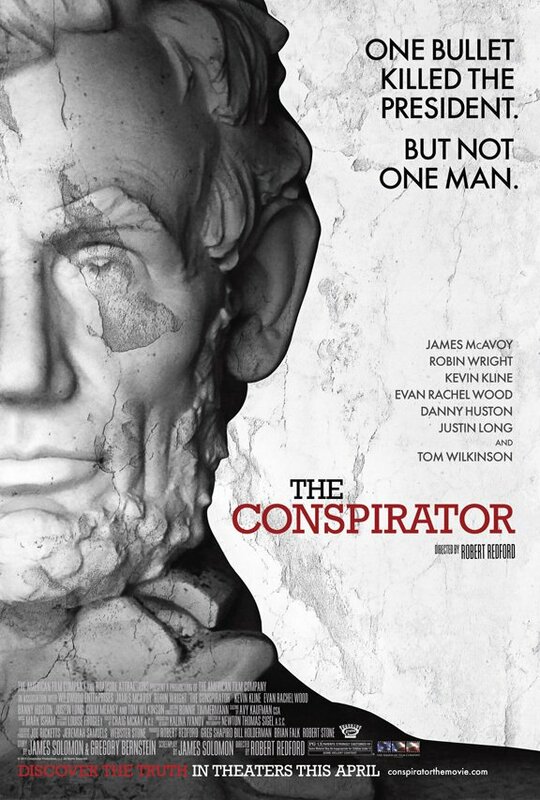 Okay, so we know that the James Solomon/Robert Redford film The Conspirator, now entering its second full weekend, has some inaccuracies to it. What are they? Here are a few obvious ones that I remember from having watched the film a week ago. Myth: When David Herold and John Wilkes Booth first arrived at the Surratt Tavern and met with John Lloyd, the film shows Lloyd walking out to the two men on horses, handing the rifles and whiskey and then going back indoors. Fact: Booth stayed mounted on his horse while Herold dismounted and joined Lloyd inside of the tavern. After Lloyd retrieved the rifles and had a couple of shots of whiskey, they walked out and gave Booth some whiskey before leaving. Herold pitched Lloyd a silver dollar to cover the cost of the alcohol. Booth and Herold were at the tavern for approximately five minutes. Myth: Booth did not break his leg while jumping from the Presidential box to the stage at Ford’s Theater, as has been commonly claimed. Fact: According to Michael W. Kauffman, author of American Brutus: John Wilkes Booth and the Lincoln Conspiracies, “Booth and Herald had switched horses by then. Sergeant Cobb and others were positive that Booth had ridden away on a bright bay mare, and everyone agreed that Herold was on a roan. But outside the city, everyone who encountered them remembered it the other way around. In light of Booth’s broken leg, the switch made perfect sense. An injured man would certainly have preferred the gentle, steady gait of a horse like the one Herold had rented. From Lloyd’s to Mudd’s, Booth stayed on that horse, and Herold rode the mare, who was now noticeably lame, with a bad cut on her left front leg. Clearly, she had been involved in an accident.” Kauffman also states that the first reference to the fall at the theater came from Booth’s own diary entry written days after the incident. In the same entry, Booth writes that he yelled, “Sic Semper Tyrannus” BEFORE he shot President Lincoln, which, according to eyewitness accounts, was yelled after he landed on the stage. Myth: Mary Surratt was put into a prison cell at the Washington Arsenal right after her capture, according to the film. Fact: She was held at the Old Capitol Prison, currently the location of the U.S. Supreme Court building and formerly the site of the hanging of Andersonville prison camp commander, Henry Wirz, for thirteen days, before being transferred to the Arsenal. She was not at the Arsenal at the beginning of her incarceration but was tried and executed there. 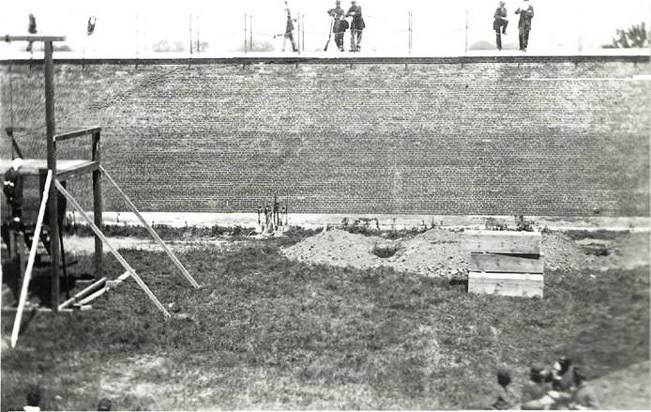 Myth: The Washington Arsenal has a moat. 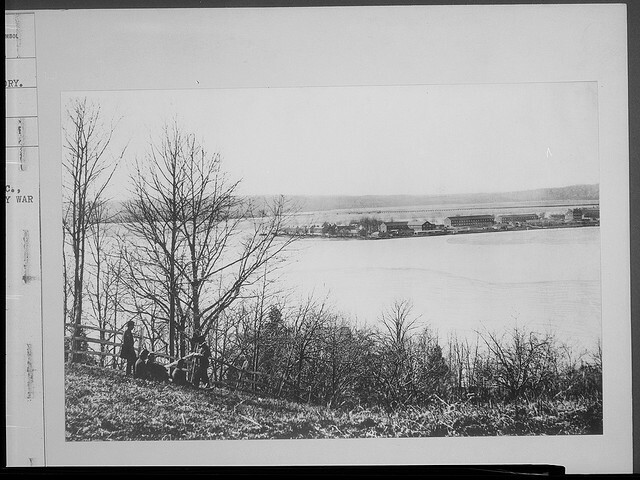 Fact: The Washington Arsenal was located on Greenleaf’s Point (also known as “Buzzard Point”) surrounded on three sides by the Anacostia River and the Washington Channel. It is currently the site of Fort McNair and the National War College. 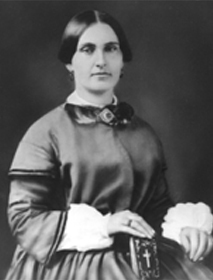 Myth: Mary Surratt was unveiled during the trial. Fact: With the exception of her plea, she was veiled the whole time, including when her daughter, Anna, was on the stand. It may make for a good Hollywood portrayal to have the heroine unveiled during her trial but it is far from historically accurate. Myth: Mary Surratt wasn’t guilty of her role in the conspiracy. Fact: This is the whole crux of the debate that has existed since July 7, 1865. The fact is when the detectives first searched the boarding house, Surratt herself was said to exclaim, “For God’s sake! Let them come in. I expected the house to be searched” (Swanson, 119). The movie excluded a lot of other testimony which gave more conclusive proof of Surratt’s guilt and failed to include that. The film IS correct in asserting Reverdy Johnson’s plea that the trial was unconstitutional because she was a civilian being tried in front of a military tribunal, which was the heart of Johnson’s argument throughout the trial, but the defense team examined numerous witnesses which only further concluded Surratt’s guilt. In fact, while trying to portray her as a pious Catholic church-goer, her defense team called up five priests, none of whom could testify that they knew her for any length of time. In essence, her own defense team unknowingly worked against her. Myth: A secret message was delivered to John Surratt appealing to his mother’s aid. Fact: This seems quite far-fetched. It is inconceivable that a message could be sent and received to a person on the run in Canada in the course of 12-hours even using the most modern transportation system at that time. This was most-likely a made-up scene to give intrigue to the film. 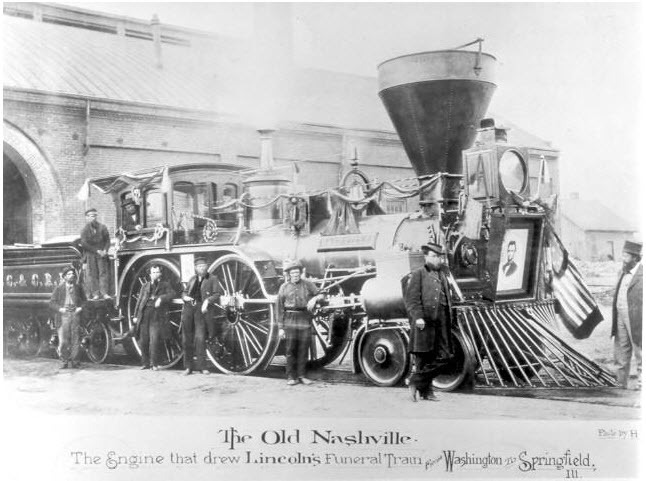 Myth: The steam locomotive in the film was the same type that was used in the Lincoln Funeral Train. 4-4-0 wood-burning steam locomotives. 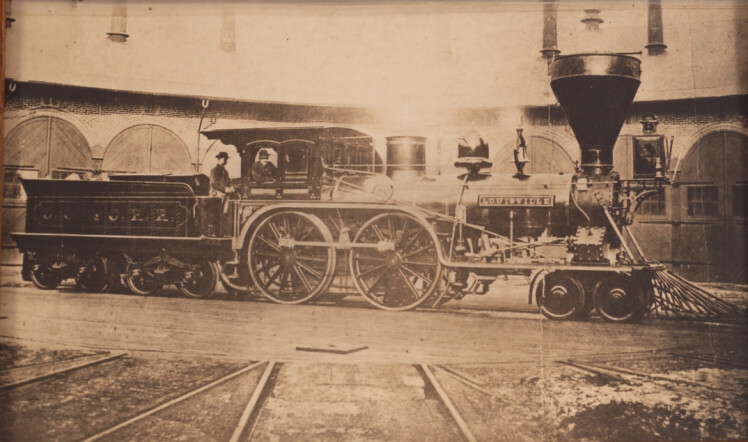 From Washington to Harrisburg, Pennsylvania – the train was pulled by B&O Railroad locomotive No. 238 with it’s sister engine No. 239 running ten minutes ahead as the advance. From Harrisburg to Jersey City, N.J., the train was pulled by Pennsylvania Railroad locomotive No. 331. The funeral car and Pullman business car were ferried across the river to New York City. From NYC to Albany, N.Y. it was pulled by the “Union” of the Hudson Railroad with the “Constitution” in advance. The Albany to Erie, Pennsylvania leg had the New York Central’s “Dean Richmond” at the helm, though another locomotive might have switched in Buffalo. The next leg was from Erie to Cleveland, Ohio, the duty fell to the Cleveland, Painsville and Ashtabula Railroad’s “William Case.” The “Nashville” of the Cleveland, Columbus and Cincinnati Railroad took the train from Cleveland to Columbus with the “Louisville” in advance. I’m not sure at this point which locomotive took the train to Lafayette, Indiana, but that’s where the “Persian” of the New Albany and Chicago railroad took over on the journey to Michigan City, Indiana. From Michigan City to Chicago, the Michigan Central railroad’s “Ranger” took the lead. The final leg from Chicago to Springfield and Lincoln’s final resting place was led by the Chicago and Alton’s engine No. 58 with engine No. 40 in advance. The train in the film appeared to be a coal-burner of a later vintage than any of these locomotives. I’ll post more information on the Lincoln Funeral Train at a later date. Myth: Frederick Aiken was a young idealist unprepared for the U.S. government’s seeming disregard of Surratt’s rights. Fact: According to Kate Clifford Larson, author of Assassin’s Accomplice, “In reality, Aiken and [John] Clampitt, convinced of their duty to defend Mary to the best of their abilities, lacked experience as trial attorneys and were left to defend her against great odds. But some of that responsibility must be placed squarely with Senator Reverdy Johnson. His actions may have ultimately doomed her. From my perspective, she did little to aid her own defense, and an attorney can only do so much if the client is not cooperative. Indeed, it was later reported that Aitken and Clampitt were frustrated by Mary’s silence.” While little information currently exists about the biography of Frederick Aiken, the stuff that we do have suggests that he was not necessarily a young pro-Union idealist. He was known to have been at-odds with Lincoln and his administration long before he was chosen as Mary Surratt’s attorney by Reverdy Johnson. However, more research needs to be done on Aiken’s biography. Myth: There were no doctors present at Ford’s Theater. 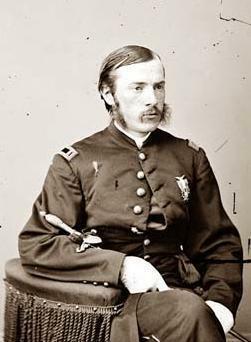 Fact: Dr. Charles Leale, a 24-year-old Army surgeon, attended the performance that night and was the first to reach the Presidential box to attend to the fatally wounded President. Because he was the first attending physician on the scene, he took the lead in patient care over all the other physicians who were in attendance that night. Dr. Charles Taft was also at Ford’s that night and became the second to reach Lincoln. Taft deferred to Leale at all phases. It was Leale who decided that Lincoln would not survive the trip to the White House on the rutted roads and opted for the boarding house instead. It was Leale’s suggestion that the President be moved out of the theater to the boarding house across the street (the first boarding house was locked and the Petersen House next door was chosen by Leale instead). The other doctors arrived later, but Lincoln was already under the care of two trained medical professionals. Grant House in Burlington, N.J. Myth: General Grant and his family were heading to Philadelphia. 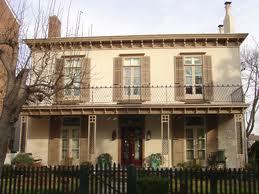 Fact: General Grant was heading to his house at 309 Wood Street in Burlington, New Jersey, a house he bought in 1864. The film was correct in that Charles Dana, the Assistant Secretary of War, sent the telegraph to Philadelphia. Uninformed movie-goers might interpret this to mean that Grant’s destination was Philadelphia, which was not the case. Another thing that the film got wrong was the “sterilized” look. Everything was too clean. Hey, this took place at the end of four years of war. The uniforms were not new. They were well-worn, torn and dirty. I can tell you that as a long-time Civil War reenactor, my uniform is well-worn, torn and dirty. Every reenactor goes through that, and we are clean by Civil War standards as happy “weekend warriors” who don’t live, march and sleep in the same clothing for weeks on end. If you want an accurate portrayal in the film, make sure that the clothes are worn BEFORE shooting begins, and the dust is everywhere. I noticed that in the courtroom scene, they are thick on the cigar smoke. Is this to cover up a lack of dust? But it gets worse – even the graves are perfectly dug. Even Alexander Gardner, who (thankfully) they properly portrayed in the film, took photos of the three graves. The coffin position was correct in the film, but the dirt taken out of the ground was piled too neatly. This is contrary to the photograph that Gardner took July 7, 1865. There were things that the film got right. The casting was extraordinary, minus the miscast Booth, who didn’t seem to fit in despite having such a prominent role in the actual plot. The reenactors were used correctly. Unlike other period films with mis-cast reenactors, they blended into the scenery like they belonged there (which they did). Secretary of State Seward’s assassination attempt by Louis Powell was correct. Seward was at home recovering from a carriage accident and had a metal brace connected to him that saved his life. 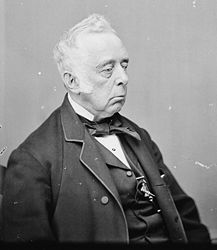 Secretary of War Stanton left Seward’s house an hour before the assassination attempt happened. Reverdy Johnson was a pro-Confederate Maryland U.S. Senator. If you do go to see The Conspirator, remember to separate the fact from fiction. Mary Surratt was tried, convicted and hanged – probably with good reason. To see my film review of ‘The Conspirator’ – click here. NEW YORK — On April 12, 1861, Confederate forces fired on Union troops stationed in Fort Sumter, S.C. The barrage marked the opening shots of the Civil War, a national tragedy that killed more than 600,000 people, destroyed the South economically and left a legacy of divisiveness that persists to this day. The war has also inspired several hundred films and TV shows, the latest of which, “The Conspirator,” starring Robin Wright and James McAvoy and directed by Robert Redford, opens today. Based on the true story of Mary Surratt, who was hanged for allegedly being part of the conspiracy to assassinate Abraham Lincoln, the film is based heavily on court transcripts of her trial, and has astonishing parallels to the present-day terrorist trials at Guantanamo — Surratt was convicted by a military, not civilian, tribunal; she was not allowed to testify in her own behalf; and her defense attorney was not allowed to see the prosecution’s evidence against her. Timeless, and for the most part, historically accurate. Which is not the case with most films about the War between the States. But it’s not just this historical minutiae that Civil War films get incorrect. There’s also a question of interpretation, themes about the war that have come and gone over the years. So before World War II, films like “The Birth of a Nation” and “Gone With the Wind” reflected the “Lost Cause” sentiment — that the South was simply fighting for states’ rights — and were very pro-Confederate. And now “The Conspirator” takes Civil War — or, technically, post-Civil War — interpretations to a new level, although Solomon is quick to point out that he began working on his screenplay in 1993, before both World Trade Center attacks. But in the film, Union concerns about possible Confederate plots to commit acts of terrorism like poisoning Washington’s water supply are distant echoes of contemporary fears. Whether future Civil War projects will be able to reflect contemporary issues and fears like “The Conspirator” does is a question yet to be answered. And there are other aspects of the conflict — the war on the high seas, the war in the West — that have barely been touched by Hollywood.